So pretty in pink, this gorgeous bouquet is certain to touch the heart of anyone lucky enough to receive it. 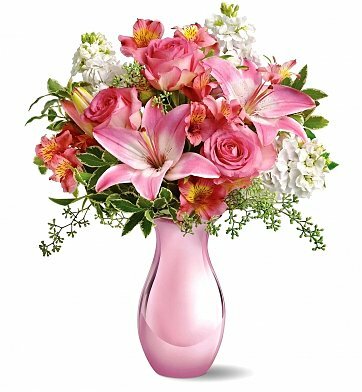 A stunning vase holds fresh pink blossoms such as 40 cm roses, Asiatic lilies, alstroemeria, stock, and seeded eucalyptus. With so many lovely flowers in such a uniquely beautiful vase, this can't-miss gift is perfect for Mother's Day, a birthday, or any day! Arrives in a stylish pink reflections vase. Measures approximately 14" x 17". Pink Reflections Bouquet is a hand delivered gift. These gifts are delivered by one of our local design centers located throughout the United States and Canada. Same day delivery is available for most gifts when ordered before the cutoff time. The cutoff time for Pink Reflections Bouquet is 2 PM in the recipient's time zone. My girlfriends loves them! She loves all the flowers I get her from y'all!